Last week, Microsoft released a preview of Project ‘Madeira’ which has added tools to enhance the adoption. Integrated features like Power BI, Office 365 giving you the power of analytics & ease in use of dashboards etc. are definitely going to help. On behalf of New ERP System (Project Madeira), most of the people’s are saying Dynamics NAV ERP Software is on verge of getting replaced; which to us seems impossible in the days to come. Microsoft Project Madeira, which is primarily targeted around SMB’s market segment; is equal to NAV 2017. There are a couple of areas where project Madeira adds a value when but have limitations on customization, functionalities etc. 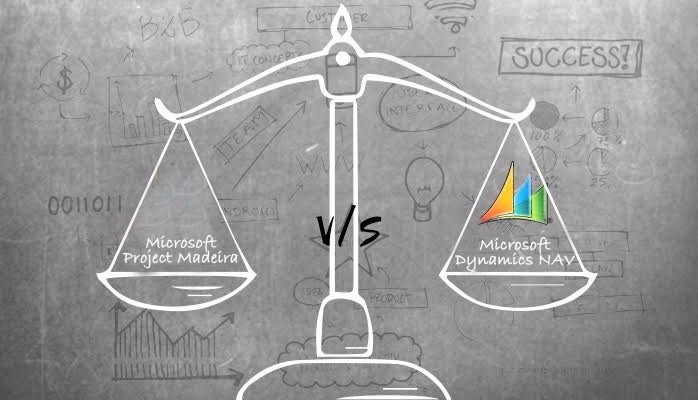 Lets evaluate the differences between Dynamics NAV 2016 and Project Madeira: Madeira is a project completely based on SaaS (Software-as-a-Service) model while Dynamics NAV works on IaaS, PaaS and On-Premise with lots of customization in the reports, dashboards meeting the industry specific workflows. We, at Navision India, don’t conquer to or envisage that Dynamics NAV would be replaced by project Madeira. As on date, approximately 124,000 organizations worldwide embrace NAV and that number is increasing daily. The critical point to ponder is; both business management solutions are different. Both of these products have fewer functionalities and features are overlapping. But have different propositions to offer. The traditional mailing systems have to replace at the same time when the ERP migration is done. Whereas, with Dynamics NAV you don’t have this compulsion. You have the freedom to choose between exchange, exchange online, O365 besides other products depending upon the organizational maturity. While ‘project Madeira’ is appropriate for startups or SMB companies, NAV is an enterprise suite to manage the critical flows and customize as per business needs. ERP products working over SaaS or in-premise mode have fewer differences or convenience being added to meet the dynamic business scenarios and trying to address business productivity, which SMB space is coping with the current. Ease of technology migration, adoptions, customizations are fewer concerns for the enterprises. Project Madeira is a more advanced solution as compared to Dynamics NAV ERP Software but the industry specific flavors, addressing to the complexities like manufacturing process automation, and HR automation are still buzzwords and would require adoption and product feature enhancement besides the need for customization. Speak to us regarding #business productivity #Resource Planning #ERP solutions – stay tuned with Navision India.